we finally tied the knot on November 1, 2018 at Los Angeles City Hall! Eloping is fun, but when you’ve restored a hotel in a place like Marfa, there’s no excuse not to host a celebration! 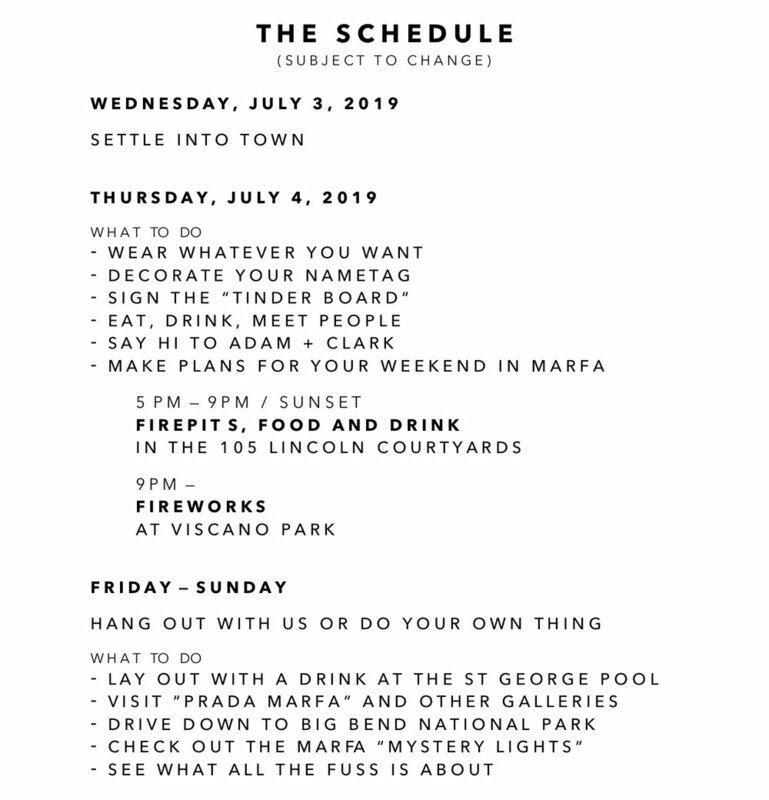 On July 4th, 2019 and the weekend following, we are opening the doors of The 105 Lincoln to the Marfa community (and we’d love it if YOU could be there, too)! Please keep in mind: This is not a ceremony; it’s a party. And without much pomp and circumstance, we invite you (and yours) to celebrate with us, and to come experience Marfa and the property we’ve poured our love into over the past few years. We invite you to navigate the rest of this website. This is our hotel site for The 105 Lincoln, where you can learn more about the property and local attractions by following the links along the top of the page. Your presence at the party would be more than generous. We already have everything we could ever need: each other (sorry, we’re gross). But if you feel so inclined — in lieu of material wedding gifts — you can contribute to the party here: using our Honeyfund Registry. Any contribution is greatly appreciated, and anything over and above our costs will go towards an as-yet unplanned honeymoon trip! Here’s the kicker: The nearest airport is El Paso, which leaves the out-of-towner with a remaining THREE-HOUR car ride to Marfa. This “Marfa Factor” is part of its allure… and largely responsible for maintaining the character and charm of the community. Clark and I understand that this “destination” commute is a big commitment physically and financially, but we want you to know about the party and extend the invite REGARDLESS of your proximity to Marfa or the likelihood of your attendance. West Texas is not an easy place to get to, but if you’re up for an adventure we’d love for you to come! For helpful information as you start planning your trip, we strongly encourage using VisitMarfa.com as a jumping-off point for how to get there, local events, and things to do. Give Marfa a Google search, or Instagram #Marfa. Despite its remote location, it’s probably the most well-documented small town in America. Accommodations at The 105 Lincoln are full. Marfa has a competitive Airbnb rental-market if you’d prefer to go that route — many visitors do. Otherwise, please use this link to find hotel accommodations in Marfa. We are holding rooms at The Hotel Saint George and The Hotel Paisano, linked below with other area hotels. Just mention Clark and Adam’s Wedding Party and book between July 1-7. The Hotel Paisano is the historic Marfa hotel (and home of Hollywood-classic GIANT). Best proximity to our property. The Hotel Saint George is Marfa’s high-end option, with an incorporated pool, full bar, and bookstore. El Cosmico is the home of the “glamping” experience. Choose a vintage trailer, teepee, or yurt. The Thunderbird Hotel is the for the hipster-chic, with classic retro motel vibes. Comes with pool and xeriscaped garden. Check back for updates and feel free to reach out tO US with ANY questions!